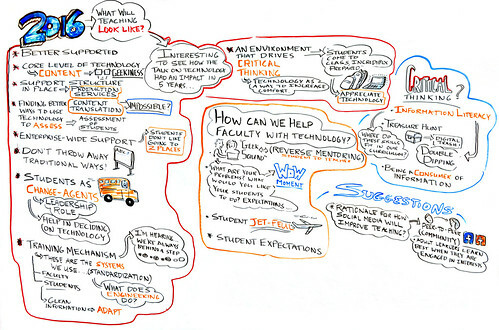 (1) How can university teaching keep up with the pace of new technology? (2) How can students maintain creativity in their pursuits under great economic pressure? (3) How can teachers incite a sense of social responsibility on the part of their students? 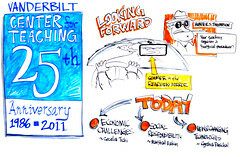 On September 9th, 2011, Alphachimp Studio scribed an event that sought to tackle these issues at the Center for Teaching's 25th Anniversary symposium. The morning began with Derek Bruff, Acting Director of CFT, and faculty panelists Cynthia Pashcal, Cecelia Tichi, and Marshall Eakin. Each panelist gave brief glimpse into the complexities of each of the three topics areas they would be leading throughout the morning, with assistance in facilitation from Tim McNamara, Derek Bruff, Joe Bandy, and former CFT director Allison Pingree. During the talk, the Vanderbilt faculty, students, staff and honored guests discussed key issues; identified much needed tech support for faculty and students; explored the value of critical thinking; and brainstormed a vision for what they desired teaching to look like in the year 2016! The big question posed by participants was this: Does Vanderbilt, through its policies, teaching, and structure, support and foster social responsibility on the part of its students? During the first half of the talk it seemed like the facilitators' role was to help people air their concerns and the limitations they face on their capacity to really engage in the community of Nashville from where they sit at the University. 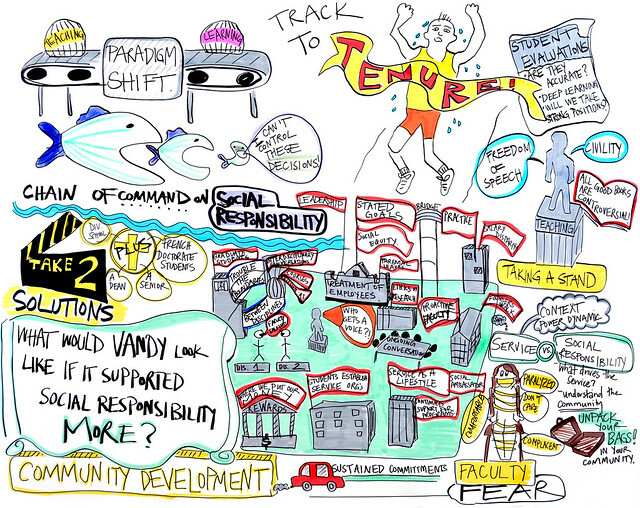 During the second half of the round table session, the group sketched out potential solutions by framing the question, "What would Vanderbilt look like if it supported social responsibility?" Providing a visual map of group suggestions of the qualities of a more socially engaged Vanderbilt was a great honor, as was participating in this way in such a candid conversation. 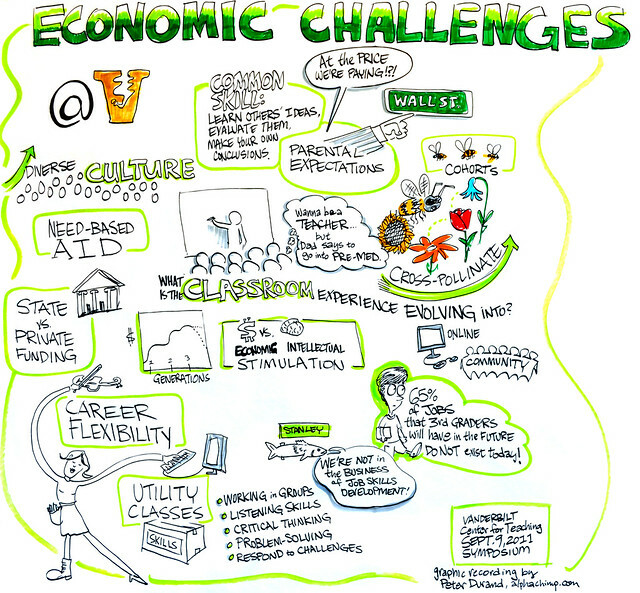 Graphic recording by Peter DurandThe two-pronged challenge seems to be both defining and delivering value through higher education. The definition of "value" was articulated in many ways: preparing students for careers; developing essential cross-discipline skills; exposure to different modes of thinking, enabling diverse perspectives; ideas and experiences to co-mingle on campus; exploring the human condition as the external culture morphs and technology redefines communication. After lunch, participants returned to the main room for final notes from the panelists, CFT's Derek Bruff, and the previous evening's keynote speaker, CFT founder Ken Bain. Work with others to design and activate programs and projects across disciplines without fear of jeapordizing professional standing with their peers, departments, schools, or broader community. 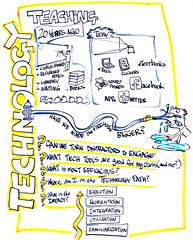 Finishing up with a plan for how to activate these ideas was a great way to celebrate the forward-thinking intent of CFT's 25th Anniversary Symposium.